Invert the phase of one of the drivers (just wire it backwards) and measure the combined acoustic response. 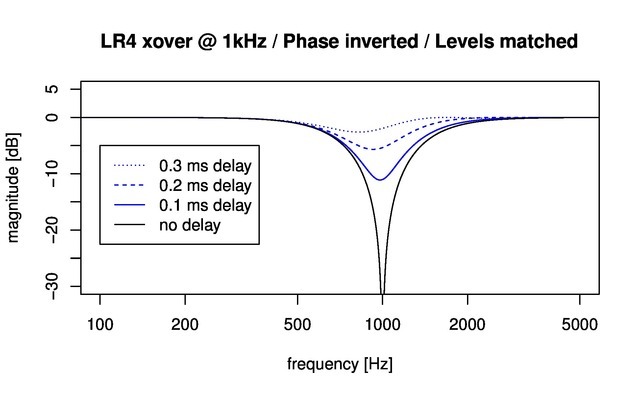 Vary the delay to get the deepest interference null at the crossover frequency. Now the drivers are 180° out of phase; wire them back up the right way round and they’re in-phase. This sounds easy, but when I first tried it there were hiccups. 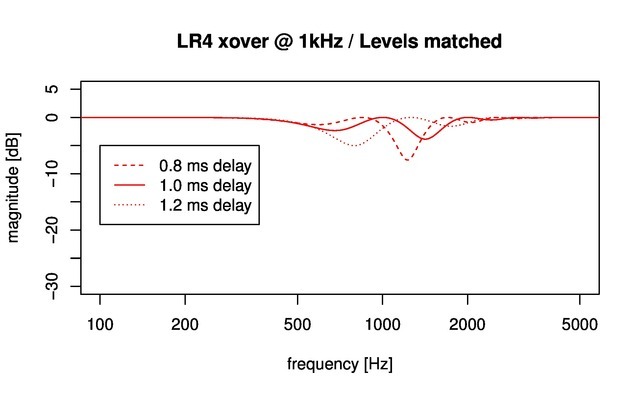 When I measured an in-room acoustic response, the room reflections made it hard to see the interference null. So I went to a gated measurement, and that worked. 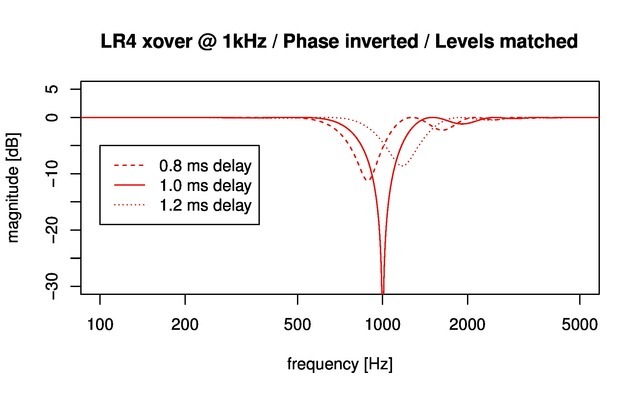 But it won’t do for a crossover below about 500Hz, where gating causes loss of resolution. I don’t know what people do. I guess you’d have to go outside, or ask for an anechoic chamber for your birthday. This happens when the drivers’ levels aren’t matched. There’s still a deep null, which gets deeper as the drivers come into alignment, but it’s not at 1kHz. Why?! Well, the interference null occurs where the outputs are 180° out of phase and of equal magnitude. If the levels are out of whack this won’t happen at the -6dB points of respective filters any more. 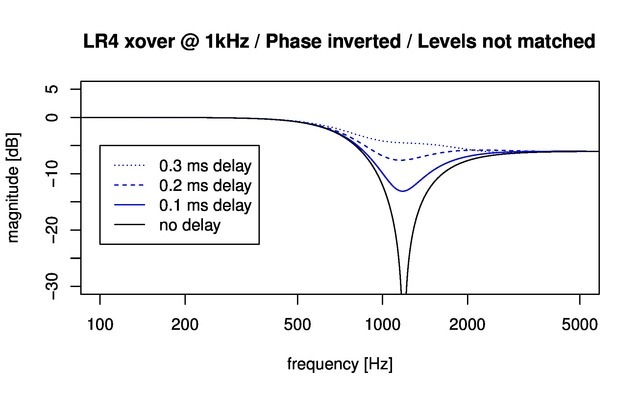 If the low-passed section is louder than the high-pass, the output levels end up equal at a frequency somewhat higher than the cross-over — and so that’s where they cancel to create the null. If it’s the high-pass that’s louder, the null moves to the left instead. No big deal: the drivers still end up in phase. But this caused me some real confusion. Maybe everyone else is just smarter. If not, perhaps this blurb will aid someone in their time of confusion. This entry was posted in Loudspeakers, Modeling & Simulation, Software by Richard Taylor. Bookmark the permalink. I love SL’s loudspeakers and am planning to build Pluto 2.1 with Pluto+ early next year (they fit in my listening room). For reasons similar to your I’d like to use a DSP. Have you or do you know of anyone who has transferred the Pluto + ASP data to a DSP? I’ve searched the Orion forum but have so far found nothing there. Thanks for your many informative posts and for any info you may have on Pluto+ DSP data. I’ve got a working DSP for Pluto 2.1, just haven’t had time to write about it. Watch here over the next couple of days.